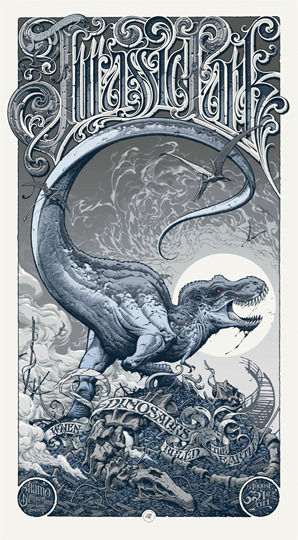 Mondo has made a Jurassic Park poster?! Yes indeed they have. It might not be everyone's favorite (Peter Sciretta from /Film doesn't like it at all) but Mondo has debuted a new poster designed by Aaron Horkey made for the latet Mondo Mystery Movie event that the Alamo Drafthouse hosted last night in Austin, TX. You may remember they did a Mondo Mystery event for Akira which result in a magnificent poster as well. Last night's Mondo Mystery screening was indeed Jurassic Park and here's the poster they gave out to go along with it. Not my favorite either, but I wish I was there last night, too! See Aaron's two variants below. The one on the left is the blue variant, via SlashFilm, the one on the right is the original, from Movies.com. As far as we know, these aren't on sale online and were only given out at the event. However, they mention that a second poster in the series, which will be "created by a yet-announced artist," is eventually going to be sold online in October timed with the release of the Jurassic Park trilogy on Blu-Ray. The complaints are calling this a "a music gig poster" or a "tour poster for a 70s rock band, like the Eagles or Stillwater." That's kind of true, but I still like seeing a unique design for one of my all-time favorite films. I absolutely love Jurassic Park, it's so incredibly good, and I never got to see it in theaters because (this is completely true) my parents wouldn't let me see it when it first came out in 1993. I've been waiting for the chance to see it return to theaters ever since (and too bad I'm not in London this fall). Like the look of these posters? Never been a fan of fonts that you can barely tell what the word is supposed to be. It all looks pretty, but that is it. If I saw that poster, I would have thought 'Jurassic Park' would have been a entirely different film. Well... They're there... Don't know what to tell ya. These are actually pretty cool and original! I certainly an original take, but as a movie poster for use in a theater it fails miserably. well for one its not a "movie poster" since that was done long ago, and this is moreso commemorating the showing and the movie. Its purpose is not to promote the movie. And secondly calling that a font is a horrible injustice. His lettering is way more traditional and classic than everyone who is just using Gotham and the like. If it's a piece of art for your house do you really need the movie name screaming at you? I wish, having now seen this poster that the new Jurassic Park takes some que from it! Much more vicious and scary - not a pg-13 film! Thats what we need an r-rated dinosaur movie with top notch vfx and story. Well, it shows the best scene in the movie, when the banner falls down reading "When Dinosaours Ruled The Earth". Aaron Horkey's work is just stunning, even the countless hours he must use on the fonts/lettering on each work(often only does the lettering). That's a hideous poster. JP is my favorite movie, & it's a classic. This poster doesn't show the classy style & wonder that is JP.